The concept of affordances has been used in robotics to model action opportunities of a robot and as a basis for making decisions involving objects. Affordances capture the interdependencies between the objects and their properties, the executed actions on those objects, and the effects of those respective actions. However, existing affordance models cannot cope with multiple objects that may interact during action execution. Our approach is unique in that possesses the following four characteristics. First, our model employs recent advances in probabilistic programming to learn affordance models that take into account (spatial) relations between different objects, such as relative distances. Two-object interaction models are first learned from the robot interacting with the world in a behavioural exploration stage, and are then employed in worlds with an arbitrary number of objects. The model thus generalizes over both the number of and the particular objects used in the exploration stage, and it also effectively deals with uncertainty. Secondly, rather than using a (discrete) action repertoire, the actions are parametrised according to the motor capabilities of the robot, which allows to model and achieve goals at several levels of complexity. It also supports a two-arm parametrised action. Thirdly, the relational affordance model represents the state of the world using both discrete (action and object features) and continuous (effects) random variables. The effects follow a multivariate Gaussian distribution with the correlated discrete variables (actions and object properties). Fourthly, the learned model can be employed on planning for high-level goals that closely correspond to goals formulated in natural language. The goals are specified by means of (spatial) relations between the objects. 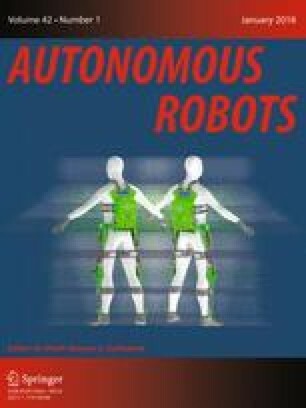 The model is evaluated in real experiments using an iCub robot given a series of such planning goals of increasing difficulty. This work was partly supported by the EU FP7 Project FIRST-MM, the IWT via scholarships for BM and DN, the Research Foundation Flanders, and the KULeuven BOF. Also by Research Infrastructure 22084-01/SAICT/2016 - Robotics, Brain and Cognition (RBCog-Lab) and Project FCT UID/EEA/50009/2013.